USDCHF is chiefly under the influence of the US Richmond Manufacturing Index, CB Consumer Confidence, S&P/CS Composite-20 HPI y/y, Final GDP Price Index q/q, and Final GDP q/q. This pair has been moving with bullish bias since the previous low at 0.95210. 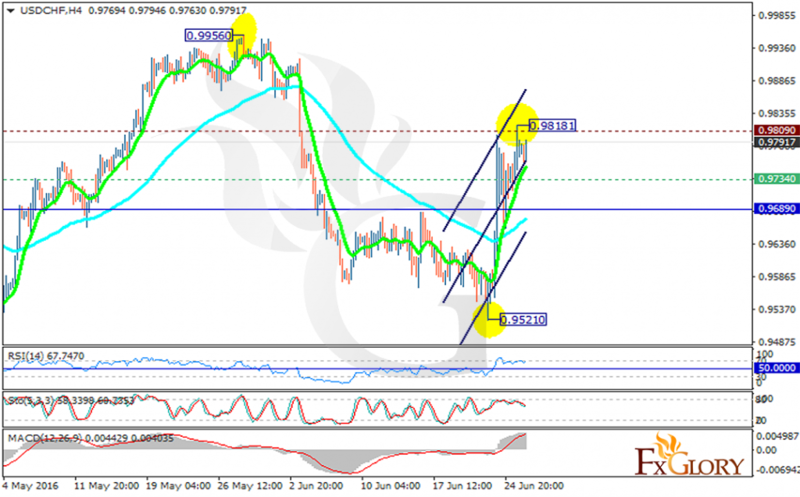 The support rests at 0.97340 with the resistance at 0.98090 which both lines are above the weekly pivot point at 0.96890. The EMA of 10 is rising and has crossed the EMA of 75. All indicators are showing price growth; the RSI is in overbought area, the MACD indicator is in positive territory and the Stochastic is not showing any clear signal. Buyers can target 0.9840 after the resistance level breakout.